I got my hair cut & got a light ombre end of April, just felt for a change but I’ve also been using heat a lot more in my hair so it needs that extra love, I’ve been seeing the brand Coco & Eve all over Instagram and decided to give it a try. It comes in a 212ml tub, quite a good amount and to be fair, not much is needed. Within the box that is designed with palm leaves amongst a pale pink background, is a tangle teaser. After I’ve washed and conditioned my hair, I apply it around my hairline, mid sections and use the teaser to spread the product over my hair evenly & it only needs 10 minutes to do its thing! With raw virgin coconut, fig essence, argan oil and shea butter its enriched with good ingredients and free from nasties such as parabens and sulphates. I love how much this mask keeps my ends smoother the more I use it, I continue to see the benefits, this is a hair mask that has become a necessity for me. I got quite lazy with not doing deep treatments but I'd always do a leave in conditioner but now adding back the deep treatment, my hair is enjoying it. 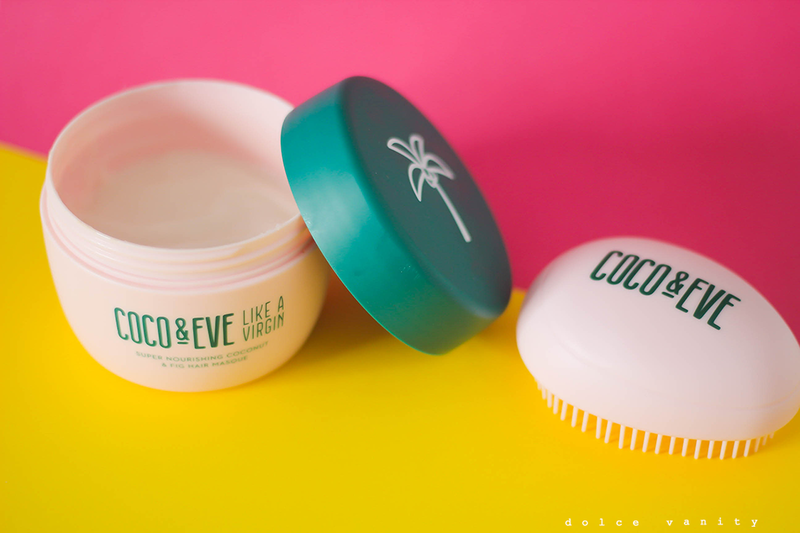 I don't really fuss too much when it comes to hair products now, as long as they're moisturising and leave my hair feeling soft and clean - what more can we ask for? I keep seeing this everywhere so it is interesting to hear your review as you never quite know what these things are like! I think I may have to give it a whirl! I haven't tried it and hadn't heard of the brand before but it sounds great and the packaging looks amazing. ooh this sounds like a fantastic product and ones I'd be interested in trying. I love shea butter. I haven't tried it, but my hair is desperately in need of some attention.